Here's a recipe to sop up some of that liquor I've been feeding you lately. Mouth watering pastrami on fresh rye, some spicy mustard and a crunchy dill pickle on the side. Sounds good, doesn't it. Well you don't have to go to the grocery store for any of it, if you're willing to put in the time. Rye bread, spicy mustard and pickles can all be accomplished in a single afternoon. (I'll post all in due course.) 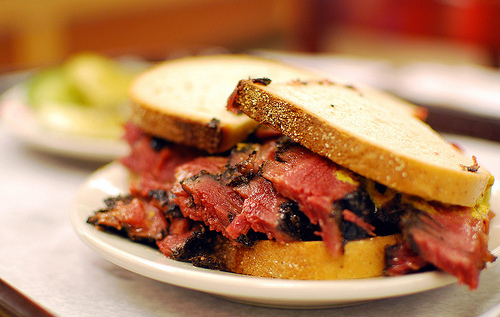 Pastrami is a little different, but far from impossible. In fact it's pretty easy. The most difficult thing is having to wait. You have to start with corned beef brisket. In an earlier post in January (To Meat or Not to Meat) I outlined how to make delicious homemade corned beef. Link to that recipe is at the bottom of this post. It takes 2-3 days to cure. Pastrami, although traditionally smoked, can be done without this step with more than satisfactory results. The secret is smoked paprika, and a slow, low roasting. The spices permeate the meat as it cooks. This recipe is an amalgam of several recipes I discovered when looking on process to make homemade pastrami. Sounds good, doesn't it? Preheat the oven to 240°F. Rinse the corned beef well and remove most of the fat, leaving 1/8" to melt into the meat as it roasts. Mix the spices and rub onto all sides of the meat. Tightly wrap the spiced meat in aluminum foil rubbed with oil. Repeat this two more times, without the oil. You are trying to create a seal that will keep in all the juices, and consequently all the flavour. Roast for 5 hours. Remove from the oven and let cool slightly. Place in the refrigerator overnight. Slice the next day. 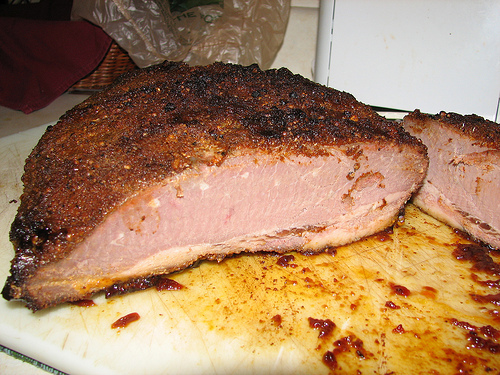 Note: If you wish for less spicy pastrami, simply remove the spices from the surface before slicing.